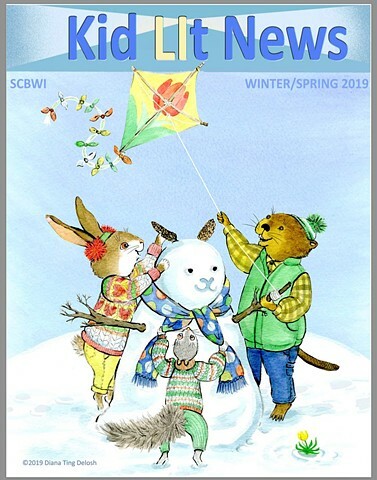 At the end of 2018 I was honored to be asked to create the cover art for the SCBWI Long Island Winter/Spring 2019 newsletter. Published March 14, 2019. Lily & Company Book Birthday is May 2018. This is one of the illustration projects I worked on in 2017. It is a 32 page soft covered picture book of assorted animal poems by Tom Gardiner and illustrated by yours truly, Diana Ting Delosh. 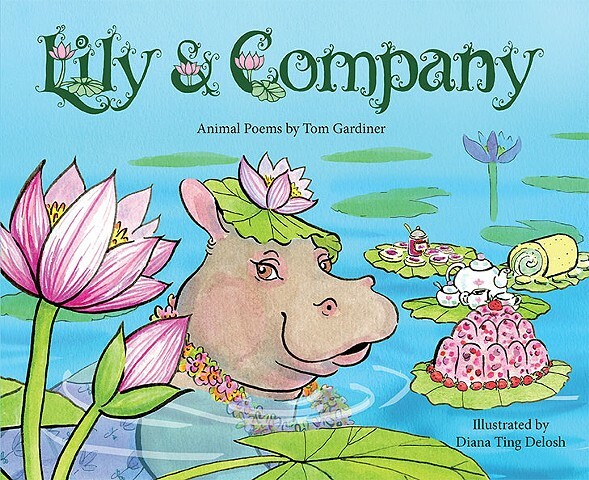 Lily Hippopotamus has invited all her friends to a scrumptious tea party on the River Thames. Her friends are from all around the globe. Hope they can all make it! - © Tom Gardiner. For a peek inside the book visit: lilyandcompany.world - while you are there, IF you want to buy it: Scroll ALL the way to the end of that page and click on the BUY NOW button. May 2017 has been a very busy month. Beginning with the Art Show at the Quogue Library. There were 14 illustrators, members of the LICWI and the SCBWI Long Island.The show ran from May 1 to May 29th. Each artist had 2 pieces in the group show. In the Fall of 2016 I was approached by Quarto UK to submit samples of my hand lettering to appear in the gallery pages of a Hand Lettering book they were working on. Hand Lettering Creative Alphabets for Any Occasion by Thy Doan Graves published by Quarto, UK and St Martin's Griffin, US and Canada out in 2017. Find more samples of my Hand Lettering in the TYPE section of my Portfolio. THREE LITTLE SPECKLED FROGS E-book illustrated by Diana Ting Delosh and performed by Michele Trachtenberg. A fun counting down or subtracting story for young kids. The illustrations were created in the first half of 2015 and the e-book was published by Farfaria in 2016. Click: Three Little Speckled Frogs to read the story and flip the pages. YAY! Happy to announce that my Nerdy Chick illustration won Honorable Mention in the #NerdyChicksDraw Contest Read all about it on the #NerdyChicksDraw Contest Winners post. I was interviewed by Kathy Temean for her popular Illustrator Saturday series on August 8th. You can see the interview at Illustrator Saturday - Diana Delosh. Every now and then you need to experiment. I've been experimenting with new styles/ways of working since the beginning of 2015. Finally, I've settled on a look, the NEW FAT LINE. On the 1 hand it is a bold, more graphic look for me. On the other hand it feels like a natural outgrowth of my thin line style. I'll be putting the Fat line illos at the beginning of each portfolio section as I make them and I deem them portfolio worthy. My Thumbelina, illustration is in the Fairy Tale illustration exhibit at the Brooklyn Public Central Library curated by Donna Miskend. June 11- September 25, 2015. Please read my Thumbelina -CBIG Brooklyn Public Library Fairytale Exhibit Blog post for more info. Ghost of a Wedding Cake, Biro illustration is in an exhibit, A Celebration of Dickens in Pictures, Illustrations by a few CBIG members at the Poe Park Visitor Center Gallery, Bronx , NY. The show runs from Feb 5 to Feb 21, 2015. For more info please read my blog entry. This is a smaller version of the CBIG Dickens Exhibit in dated September 2012. Packy & Frip Published Jan 2014! Happy to announce that the 32 page full color picture book, Packy & Frip, A Country Mouse and a City Mouse has been published as an e-book by Pearson Digital Studio, Inc. January 2014. Packy & Frip was written by Alicia Zadrozny, illustrated by Diana Ting Delosh, book design by Jaye Medalia. I had worked on the illustrations for the 32 page picture book -August through September 2013. It's been a busy, busy, year. Unfortunately most of what I've been up to has been top secret. Which is why I've been very quiet on the news front. BUT thankfully there is one project I can talk about. Ransom: A Demanding Collaboration with More Than 300 Artists is a group exhibit at the Wayfarers Gallery in Brooklyn, NY. Each participating artist was assigned a word from an original story. My word was idea. We had to create a small art piece that depicted the word. The effect of the exhibit was a huge expansive ransom note. As for my other projects...hoping some of them get published soon so I can share the news. I had the pleasure of illustrating this fun e-book, The Happy Birthday Book, written by Olivia Grey for Farfaria. CBIG group show - Mother Goose Re-Imagined at the Flinn Gallery in Greenwich CT. The show runs from December 6th to January 16th 2013. I am exhibiting 3 ink and water color paintings. They are: PETER PETER PUMPKIN EATER, TWINKLE TWINKLE ELEPHANT STAR, 3 BOLD MICE. Please click on the titles to see the illustrations in my portfolio. Happy to announce that the e-book I illustrated, The Farmer's Field of Gold, written by Brett Hendricks has been published by Farfaria. Happy to announce that the illustrations I've been working on since spring 2012 have now been published. ONCE UPON A MIDNIGHT - story by Kelly Morrison Handerhan - and illustrations by yours truly, Diana Ting Delosh is now available on Amazon. You can view the cover in the BOOK section of this website OR see it on AMAZON. Some of the illustrations will also be included in my portfolio. I will also be blogging about the process on my BLOG. I am currently exhibiting my illustration, A Ghost of a Wedding Cake, in a group show. A Celebration of Dickens in Pictures, Illustrations by the CBIG at the Yonkers Riverfront Library Gallery. The show runs from August 25 to October 31, 2012. The artist reception is on September 13th. This illustration may be viewed in my Black & White Portfolio. To read more about it please see my blogpost A Ghost of a Wedding Cake. I along with my fellow CBIG officers were panelists at the New York Public Library on June 2, 2012. Saturday, June 2, 2012, 2 - 3 p.m.
NYPL Stephen A. Schwarzman Building, at 42nd Street, Rm. Margaret Liebman Berger Forum. Donna Miskend, President/Exhibition Curator; Vicky Rubin, Webmaster/Listserve Manager; Diana Ting Delosh, Communications Officer/Blogzine Manager; Maria Madonna Davidoff, Postcard Designer and Ruth Karpes, Meeting Hostess; had a chat about CBIG, and our individual experiences in Children's Publishing with moderator Elizabeth Bird, Youth Materials Collections Specialist. Time to Spiff up this website. Added new sections: BOOKS, FOOD and TYPE. Links to my online stores are now conveniently located at the top of each web page. Making it very convenient to visit my stores to shop for my illustrations appearing on GREETING CARDS, GIFTS and ARTPRINTS. Exhibited 3 of my illustrations in a Group Show along with CBIG/LICWI member illustrators at Gallery Connect, Huntington, NY. To see the pieces exhibited please read my blog post, Seasons - Gallery Connect March Show. Working on 2 hush hush illustration projects. Busy Spring. Yay I can finally tell you about the 2 projects that I was sworn to secrecy until the company was officially launched. From mid-September 2011 to the beginning of February 2012, I illustrated 2 books for Farfaria, An Armful of Acorns by Adrian Riding and The Greedy Ant Eater by Christine Sawinski. I'm happy to say that Farfaria went live on February 15th and both of my books are now available on the App store. An Armful of Acorns click HERE. The Greedy Ant Eater cleck HERE. My friend and fellow GCU and Zazzle artist, Judy Adamson interviewed me via E-mail for her blog. Please visit Judy Adamson's Art and Design Blog to read the interview. Just launched my new blog, The Art Hare's Wares that focuses on my illustrations on products and in my stores. If you're in the area come and see our work. You'll find our art in the Adult Room, framed art and in the children's room, Kid friendly duplicates. If you can't make it never fear, I'll be posting all 18 illustrations on the CBIG Blogzine during the months of September & October 2010. My piece, Dragon Picnic may be viewed here in my portfolio and on the blogzine. Visit CBIG-NYC.COM to find out more about my group. From June to August 2010 I taught as a One-on-One Directed Study Advisor for the Academy of Art University in San Francisco, California. My area of expertise as a working illustrator is in expressive animal illustrations. This summer I worked with 2 illustration grad students, Yuki and Li-An advising them on their thesis - an educational alphabetical card game and a picture book. Would love to get more of this kind of work. Date: May 24 - 28, 2010. My painting: Moi at 9, © Diana Ting Delosh, Ink & Watercolor. A romanticized self portrait of myself at 9 doing one of my favorite activities: drawing in the garden with my cat, Gracie beside me. The show: Features original post card sized art, 6 x 4" by female illustrators. The assignment: a self-portrait - at any age, any media, any style, but must be 2D. The exhibit is sponsored by Tilbury House, Publishers. The launch party is on Monday, May 24th (the night before BookExpo), beginning at 6pm at Book Culture. The exhibit will remain up at Book Culture through the end of the week. Art will be for sale to benefit Powered by Girl. Due to popular demand, the Harborfields Library has extended my exhibit. 13 Spring themed ink and water color illustrations, original exhibition date from March 5 - April 30th has been extended to the end of May 2010. 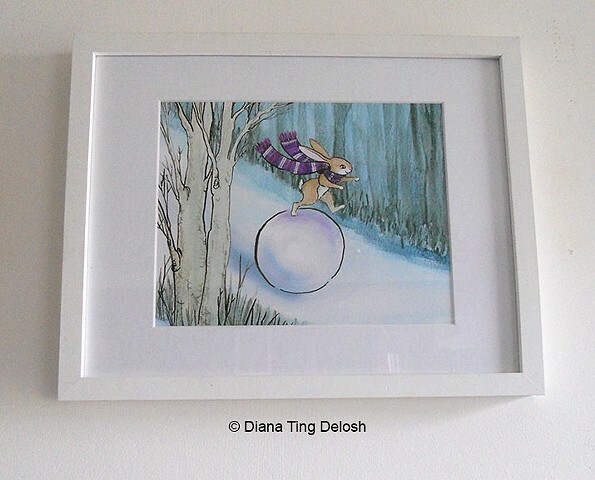 Diana Ting Delosh's Spring themed illustrations now showing at the Harborfields Public Library, Children's Room. 13 of my whimsical illustrations will be on display from March 5 - April 30, 2010. If you're in the area stop in and take a gander. For more details and behind the scenes info please browse my blog at dtdelosh.blogspot.com. Just received my printed copies of Merry Christmas CD-Rom & Book from Dover Publications. My illustrations are on pages 40 and 41. The book will be on store shelves this fall if not sooner. Highlights/High Five magazine - Bonus Pages: Make Your Own Mini-Book. Illustrated by Anna Currey. Read about the story behind the story at dtdelosh.blogspot.com The Hare Illustratère See blog entries: April 2, 2009 entry - Mice by another name. and August 18, 2008 - Pip & Squeak! Pewter Plate Award from Highlights High Five for Puzzle Poem of the Year! YAY! Please scroll down to Bubble Trouble! - 6/24/08 for more info about the poem. Read more about the award at dtdelosh.blogspot.com, The Hare Illustratère July 9, 2009. Click to see Real Pewter Plate- july 17, 2009 post. Have been busy working on the official blog for CBIG. As usual nothing is as simple as it seems and it all takes longer than expected. BUT it is up and running and after a S-L-O-W start it is all starting to gell. Please visit cbig-nyc.blogspot.com, where members will be showcasing their illustrations and announcing their professional children's book publishing and related industry news. Recently finished a project for Dover Publications. 10 of my Christmas illustrations will appear in their Christmas CD-Rom & Book. It will be on the shelves next fall in time for Christmas 2009. Worked on a flash animation project with a new client, the Woo Agency. Woo found me through my portfolio on ChildrensIllustrators.com/DianaTDelosh. I'll be posting more about this very exciting flash animation project when they're finished with the animation magic. 2 illustrations from Where is Princess ___ are in my portfolio: Castle and Frog Pond. Click HERE for a preview of the animation work in progress! Added 8 new designs to my GCU store - now I have over 250 whimsical cards at Diana's Cards! And I'm busy helping my fellow CBIG officers prep for our annual CBIG November Portfolio/Dummy Review. Needless to say October was a very hectic, whirlwind of a month! Highlights/High Five magazine just accepted my pre-school verse Pip & Squeak. Publication date to be determined. Highlights/High Five magazine - pg 12 & 13. Illustrated by Holli Conger. High Five magazine for kids 2 -5 years of age. A new monthly from Highlights. Read about it at dtdelosh.blogspot.com The Hare Illustratère June 30, 2008 entry - Bubble Trouble from Idea to Publication. Started a blog about my artventures - The Hare Illustratère. The 1st item is my Illustration post for the word: Garden on Illustration Friday. • But the big news is that I finally found a place to post my very nifty store widgets and banners - YAY!